Late October is the Season of Jays. Three kinds of them are hanging around the house: Steller's jays, scrub jays, and blue jays. We must be on some kind of habitat boundary for the blue jays--some years there are none, but this year I have seen as many as five at once. And whichever jay is nearest starts calling excitedly when the birdfeeders are brought out from the garage, whenever M. or I get around to it. They go through quantities of sunflower seeds. They are not eating it all, of course, but stashing little caches of seeds in the duff under the pine trees. 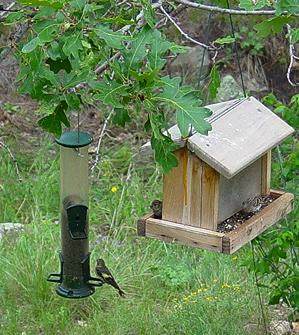 Meanwhile the level in the thistle feeders stays high. The pine siskins are gone. In the photo, pine siskins feast on both Niger thistle and black oil sunflower seeds at adjacent feeders. They are the background birds in the crowd scene, but we miss them when they disappear. It happens like this--the summer siskins vanish, then there are some weeks of no siskins, then they reappear. Or a new flock arrives. I have no idea. A siskin makes me think of those conservative men's suits that reveal jacket linings of shocking pink or scarlet. In their case, it's the flash of lemon yellow when they lift their wings--a yellow like the breeding yellow of the American goldfinches that often flock with them. Something in me will not be settled until they arrive.